The Institute of Social and Economic Research (ISER) at the University of Alaska Anchorage has been at the forefront of public policy research in Alaska for more than half a century. ISER’s multidisciplinary staff studies virtually all the major public policy issues Alaska faces. That work helps Alaskans better understand the state’s changing economy and population—and the challenges and opportunities that come with change. All ISER’s research is available to the public, and ISER makes sure Alaskans benefit from that research by disseminating publications, presentations, and other products online and in hard copy to government agencies, private businesses, libraries, the press, and individual Alaskans. ISER faculty and staff routinely do presentations to public and private groups around the state, and sometimes in other states or countries. All recent and most older publications are available online. ISER researchers also routinely respond to inquiries from the press and the public. Besides doing research, ISER faculty teach graduate and undergraduate classes at UAA. Classes taught vary by semester, but include economic research, history of the Alaska economy, environmental economics and policy, public land management, research methods, and communication policies and strategies. ISER adopted its logo from a woodcut Ronald Senungetuk created for ISER in 1975. Senungetuk is an internationally known Alaska Native artist originally from the community of Wales in northwest Alaska. 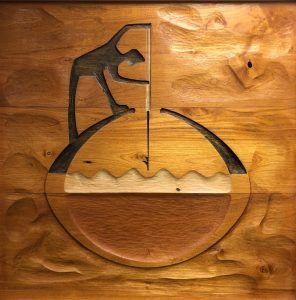 The logo woodcut and several other woodcuts he created for ISER are on display at ISER’s offices in Anchorage. ISER is an institute within the College of Business and Public Policy at UAA and has a staff of about 45—including faculty, research associates, and support staff. To learn more about ISER faculty and staff, see the People section. ISER also frequently hosts visiting researchers and employs student interns. Its annual budget varies, but averages about $4 million to $5 million. In a typical year, ISER generates contracts and grants that cover three-quarters of its budget. UAA funds make up the other one-quarter, supporting some research as well as teaching and public service. The Institute of Social and Economic Research (ISER) started small: in 1961, the second Alaska Legislature approved spending $5,415 to establish a research organization, as part of the University of Alaska Fairbanks, that would develop and publish economic and demographic information for Alaska. But If it hadn’t been for two long-time Alaskans—George Rogers and Vic Fischer—there might never have been an ISER. George Rogers was an economist who had lived in Juneau since the 1940s and had advised several territorial governors. Right after Alaska became a state, in 1959, Rogers did the state’s first fiscal analysis, and it was Rogers who persuaded legislators that the new state needed an organization capable of studying the big social and economic changes it would face. He helped get the new organization off the ground, and for the next half century made huge contributions to Alaskans’ understanding of their economy and their state. He died in 2010. Vic Fischer had been a territorial legislator and in 1955-1956 was a delegate to the convention that wrote Alaska’s constitution. In 1966, Fischer became ISER’s first official director. It was a shoe-string operation at the time, but Fischer won a major grant from the Ford Foundation that allowed ISER to truly start building a research organization capable of broadly studying Alaska’s people, economy, and government. (Through 1976, ISER was actually called the Institute of Social, Economic, and Government Research.) Fischer was ISER’s director until 1976, and he continues to have close ties with ISER in 2018. When Lee Gorsuch became ISER’s second director, in 1976, he opened an office in Anchorage, in addition to the Fairbanks office, and in 1984 ISER formally became part of the University of Alaska Anchorage. It is affiliated with the College of Business and Public Policy. Over the nearly 60 years since ISER was founded, the faculty and other researchers—who come from many disciplines—have continued the work the legislature asked them to do in 1961: studying the population and economy of Alaska and helping government, the private sector, and the people of Alaska better understand and deal with change. And ISER now includes two centers that have widened its research capability: the Center for Alaska Education Policy Research (CAEPR) and the Center for Behavioral Health Research and Services (CBHRS). CAEPR had its beginnings in 2010, when the University of Alaska Foundation awarded ISER funds to establish an education research center. CBHRS was established at UAA in 1999, and became part of ISER in 2015.